And just like that, January is almost done. I did move a lot of projects forward this week! I plan on getting a bunch of piecing done today and tomorrow because we have TWO snow days due to the extreme cold (down to the negative teens) and ice. I finished this string log-cabin inspired quilt. It measures 52" x 53". This is my new project called Owl's Well That Ends Well. It's an RSC19 project I'll try to make two blocks per month. I think they are pretty cute. I found these blocks in an RSC (Rainbow Scrap Challenge) box and made a red one. 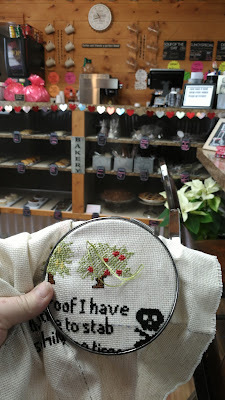 This is the slow stitching project that I started last week. It's a mystery sampler. Although I finished a project this week, I DID start a new project this week. It's called Owl's Well That Ends Well. 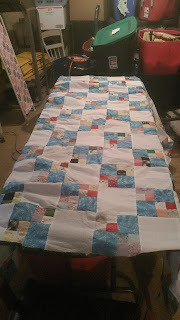 It's from the book Quilts for Scrap Lovers by Judy Gauthier. . I have 69 projects in the works. 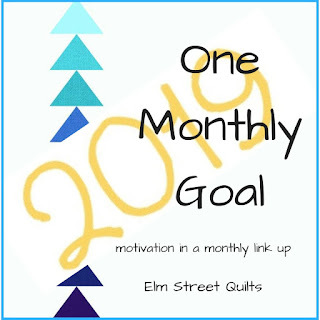 I'm linking up at Elm Street Quilts for the OMG linky party! 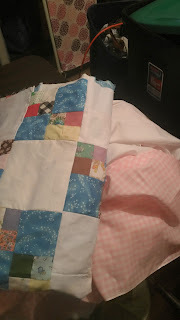 This quilt was also one of my FAL 2019 Q1 goals as well. I'm linking up to the FAL here. The Block Lotto is a fun site. 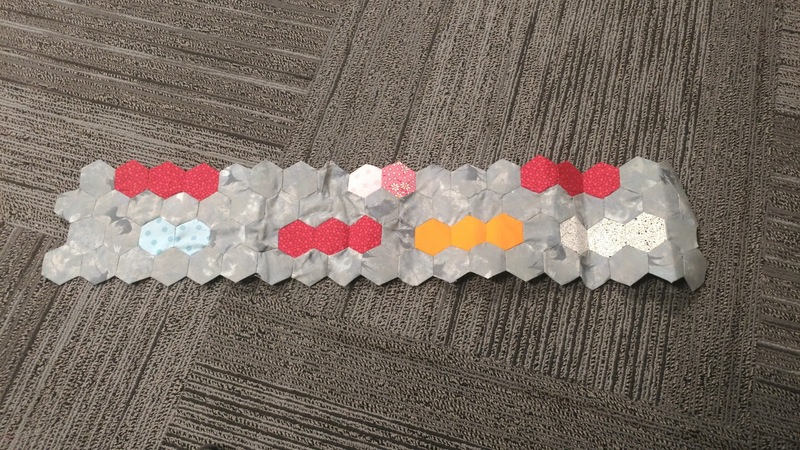 Each month there is a block pattern with a specified color combination to be made. Each block counts as an entry into the lotto. (Usually you can make 8 or 9 blocks -- see instructions on the site for details of that month.) At the end of the month winner(s) are drawn. If you win, blocks are mailed to you. If you do not win, you mail your blocks to the winners. 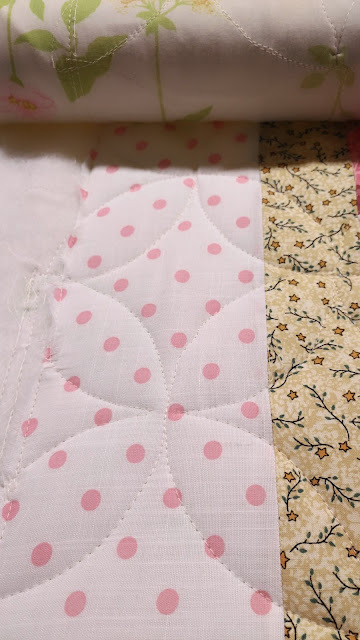 I have not yet decided if I will make the big 2019 Sampler Quilt or just make a baby quilt. 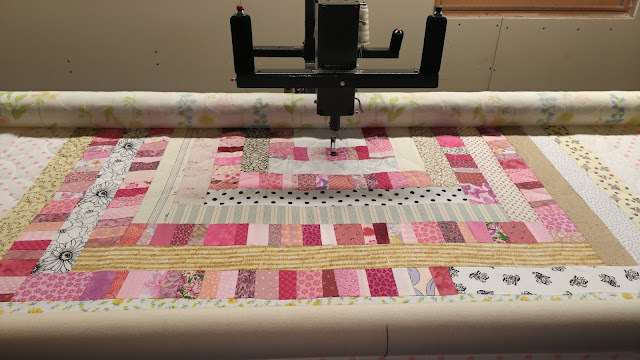 The Sampler quilt would require waiting for each block pattern to come out each month and filling in the color scheme chart. Hmmm. I will stew on this for a while. Seeing them like this sure would make a cute baby quilt with little sashings and red cornerstones... I'm starting to lean that way already. I do have quite a few projects on my plate. Seriously? It's the last Sunday of January already? Wow. Even though it's super cold (mostly in the teens here in Ohio) time is flying. I found my large Aida cloth! I didn't start this free sampler group until last week. The pattern for January is this beautiful this peacock. I can't wait to see what February brings. I better keep stitching. I found FREE cross stitch sampler on a Facebook group. It's called Linen and Threads - Mystery Sampler SAL. 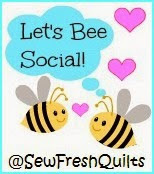 The website for the free patterns each month is here. January started off with a beautiful this peacock. I can't wait to see what February brings. I better keep stitching. The pattern is provided. You pick the colors. 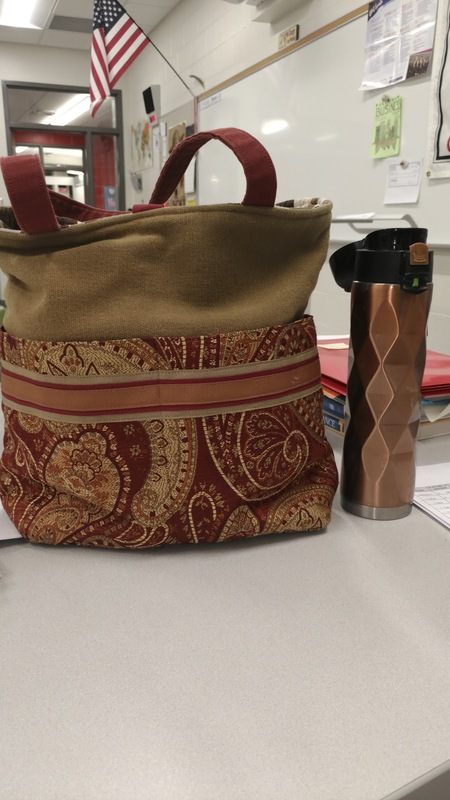 This week at school another teacher gave me her old tote bag because she thought of me. Isn't that sweet? This is PERFECT for my new project! Look at all those pockets! There are pockets on the inside as well. It even matches my thermos. I'm linking up with Kathy at Kathy's Quilts. for Slow Sunday Stitching. Come check out the fun. Just for fun I'm posting a picture of Wiggles the rooster. Owen was a huge fan of the Wiggles -- a singing group from Australia that entertain children. 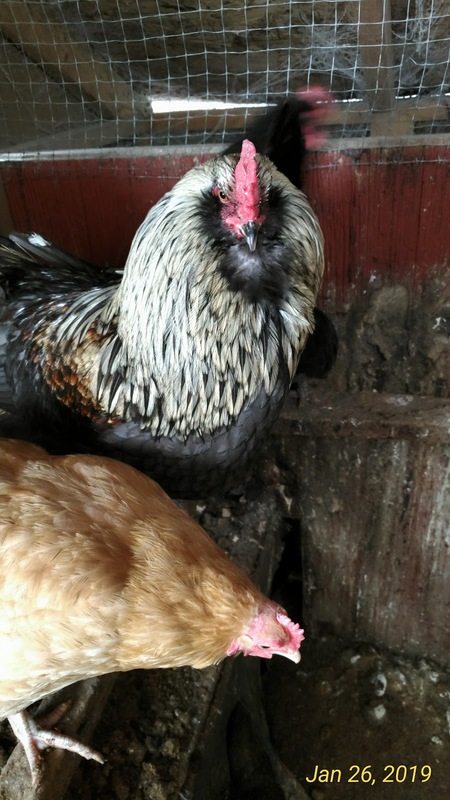 The chickens don't like to go outside when there's snow on the ground. I opened the brooder part of the coop so that they could reduce boredom and go into the other "room". Wiggles got his name when our son was younger. I still remember bringing him home in the cab of the truck with my sister-in-law holding him wrapped in a towel on the front seat. That was 3/21/15. He's a first generation Easter Egger. He is soooo calm and tame. He's the king of the roost! 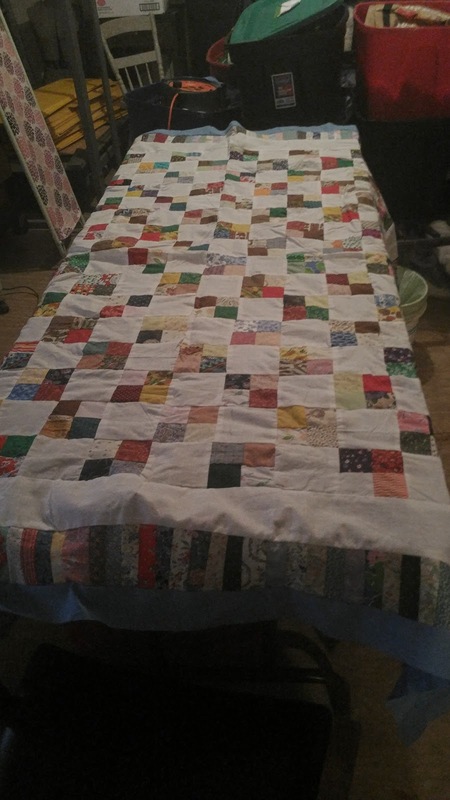 Today I have this log-cabin style string quilt on the longarm frame. 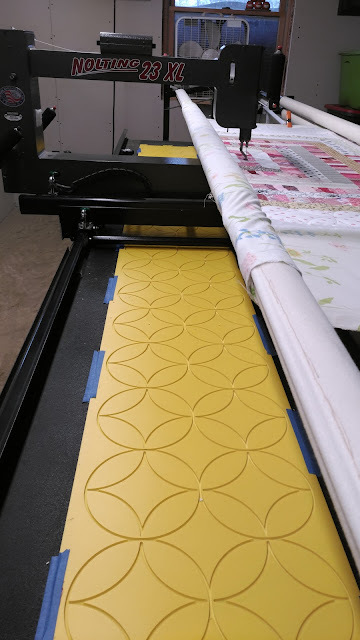 I am quilting it with Circle Lord's 7 Treasures of Buddha giant template board. I recently purchased this board used. This is my first time using it. It was easy to figure out where to go. The rows matched up nicely. The quilting pattern is not as dense as Swirls. The board can be moved three inches and a second pattern could be traced making a different pattern that is more dense. I'm liking it like this right now. Victorian Motto Sampler Shoppe is having a giveaway. Click here! 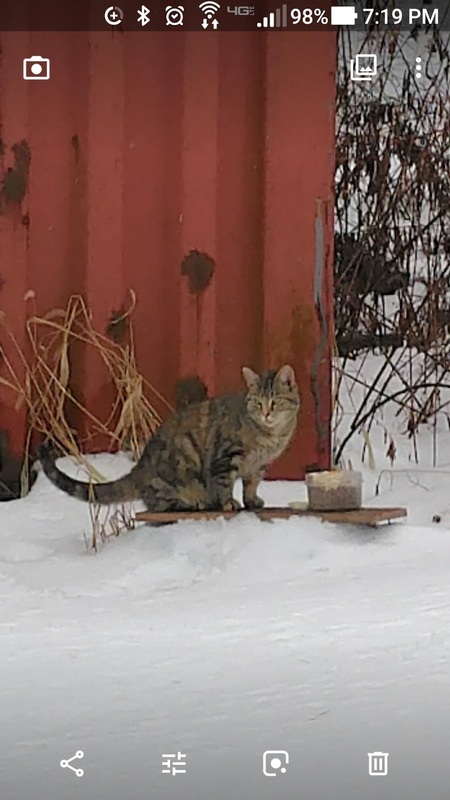 Here's a picture of Betty eating on her "patio deck" to keep her little feet out of the snow. She doesn't seem to mind the snow. Any place I go from house to house to building to barn to coop... she follows me. She came to our house to live during the summer of 2018 as a little kitten. When my mom was little she talked about walking up hill in the snow both ways to school. 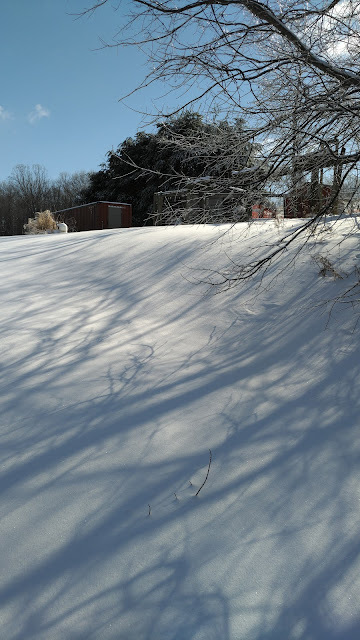 This is one of the small hills that I have to walk up to feed the chickens. I took this picture because the snow was so glazed over. 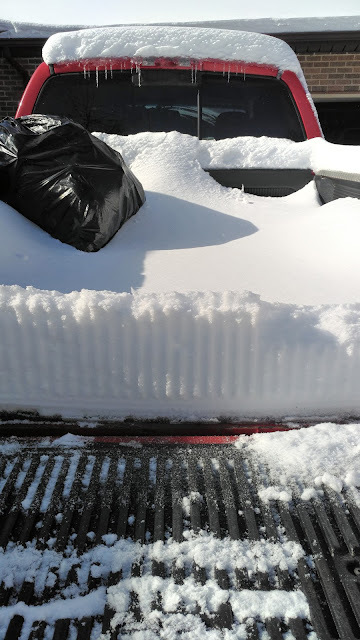 It was so smooth and untouched. Beautiful! 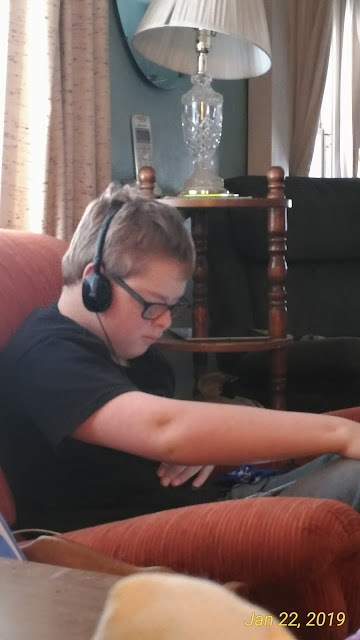 And Mr. Sunshine was happy to stay inside and have some free time on his iPad. He earned it.